Mutual Ground is excited to announce its upcoming “Survivors’ Art Show” at Mixology Salon on Friday, August 24th, from 5:00 to 8:00 p.m. This inspirational and educational event is open to the public free of charge. 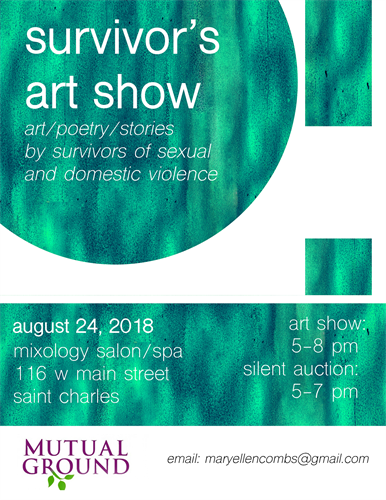 The show will exhibit art created by Mutual Ground’s clients and art contributed by community artists interested in supporting Mutual Ground and raising awareness around sexual assault/abuse issues. The art show focuses on a theme designed to speak to a survivor’s experience. The artists displayed in this show were asked to use a medium of their choice to visually capture the complex process of healing. Artists were encouraged to try and illustrate the wide range of emotions related to a survivor’s healing journey. The art exhibit will also include a silent art auction and raffle with all proceeds directly benefiting Mutual Ground.